The 15th South China Sea (Yangjiang) Fishing Festival opened at Yangjiang Hailing Island Zhapo Central Port yesterday noon. The Sailing Ceremony was presided over by Yangjiang Deputy Mayer Feng Songbai and Mayor Wen Zhanbin gave a speech then. After the General of Guangdong Ocean and Fishery Department Wenbin annouced the sailing order, more than 1000 ships departed from the port to start catching fish. 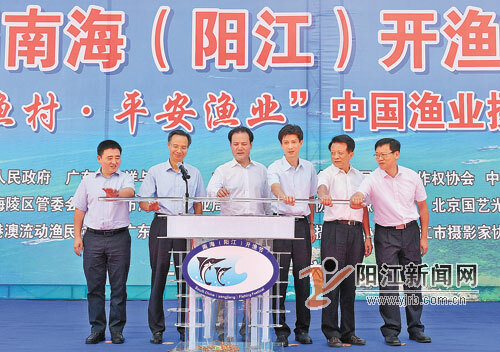 This festival was hosted by Yangjiang Government and Guangdong Ocean and Fishery Department. Copyright © 2012 Yangjiang Municipal People's Government All rights reserved.